The Xiongnu [ɕjʊ́ŋ.nǔ] (Chinese: 匈奴; Wade–Giles: Hsiung-nu) were a tribal confederation of nomadic peoples who, according to ancient Chinese sources, inhabited the eastern Eurasian Steppe from the 3rd century BC to the late 1st century AD. Chinese sources report that Modu Chanyu, the supreme leader after 209 BC, founded the Xiongnu Empire. During the Sixteen Kingdoms era, they were also known as one of the Five Barbarians who took part in a uprising against Chinese rule known as the Uprising of the Five Barbarians. Attempts to identify the Xiongnu with later groups of the western Eurasian Steppe remain controversial. Scythians and Sarmatians were concurrently to the west. The identity of the ethnic core of Xiongnu has been a subject of varied hypotheses, because only a few words, mainly titles and personal names, were preserved in the Chinese sources. The name Xiongnu may be cognate with that of the Huns or the Huna, although this is disputed. Other linguistic links – all of them also controversial – proposed by scholars include Iranian, Mongolic, Turkic, Uralic, Yeniseian, Tibeto-Burman or multi-ethnic. The Han sent princesses to marry Xiongnu leaders in their efforts to stop the border raids. Along with arranged marriages, the Han sent gifts to bribe the Xiongnu to stop attacking. After the defeat at Pingcheng in 200 BC, the Han emperor abandoned a military solution to the Xiongnu threat. Instead, in 198 BC, the courtier Liu Jing [zh] was dispatched for negotiations. The peace settlement eventually reached between the parties included a Han princess given in marriage to the chanyu (called heqin) (Chinese: 和親; literally: 'harmonious kinship'); periodic gifts to the Xiongnu of silk, distilled beverages and rice; equal status between the states; and the Great Wall as mutual border. While the Xiongnu benefited handsomely, from the Chinese perspective marriage treaties were costly, very humiliating, and ineffective. Laoshang Chanyu showed that he did not take the peace treaty seriously. On one occasion his scouts penetrated to a point near Chang'an. In 166 BC he personally led 140,000 cavalry to invade Anding, reaching as far as the imperial retreat at Yong. In 158 BC, his successor sent 30,000 cavalry to attack Shangdang and another 30,000 to Yunzhong. Full-scale war broke out in autumn 129 BC, when 40,000 Chinese cavalry made a surprise attack on the Xiongnu at the border markets. In 127 BC, the Han general Wei Qing retook the Ordos. In 121 BC, the Xiongnu suffered another setback when Huo Qubing led a force of light cavalry westward out of Longxi and within six days fought his way through five Xiongnu kingdoms. The Xiongnu Hunye king was forced to surrender with 40,000 men. In 119 BC both Huo and Wei, each leading 50,000 cavalrymen and 100,000 footsoldiers (in order to keep up with the mobility of the Xiongnu, many of the non-cavalry Han soldiers were mobile infantrymen who traveled on horseback but fought on foot), and advancing along different routes, forced the chanyu and his Xiongnu court to flee north of the Gobi Desert. [page needed] Major logistical difficulties limited the duration and long-term continuation of these campaigns. According to the analysis of Yan You (嚴尤), the difficulties were twofold. Firstly there was the problem of supplying food across long distances. Secondly, the weather in the northern Xiongnu lands was difficult for Han soldiers, who could never carry enough fuel. [note 1] According to official reports, the Xiongnu lost 80,000 to 90,000 men, and out of the 140,000 horses the Han forces had brought into the desert, fewer than 30,000 returned to China. Ban Chao, Protector General (都護; Duhu) of the Han dynasty, embarked with an army of 70,000 soldiers in a campaign against the Xiongnu remnants who were harassing the trade route now known as the Silk Road. His successful military campaign saw the subjugation of one Xiongnu tribe after another. Ban Chao also sent an envoy named Gan Ying to Daqin (Rome). Ban Chao was created the Marquess of Dingyuan (定遠侯, i.e., "the Marquess who stabilized faraway places") for his services to the Han Empire and returned to the capital Luoyang at the age of 70 years and died there in the year 102. Following his death, the power of the Xiongnu in the Western Regions increased again, and the emperors of subsequent dynasties were never again able to reach so far to the west. Lajos Ligeti was the first to suggest that the Xiongnu spoke a Yeniseian language. In the early 1960s Edwin Pulleyblank was the first to expand upon this idea with credible evidence. In 2000, Alexander Vovin reanalyzed Pulleyblank's argument and found further support for it by utilizing the most recent reconstruction of Old Chinese phonology by Starostin and Baxter and a single Chinese transcription of a sentence in the language of the Jie people, a member tribe of the Xiongnu Confederacy. Previous Turkic interpretations of the aforementioned sentence do not match the Chinese translation as precisely as using Yeniseian grammar. Pulleybank and D. N. Keightley asserted that the Xiongnu titles "were originally Siberian words but were later borrowed by the Turkic and Mongolic peoples". 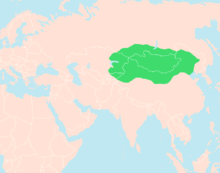 The Xiongnu language gave to the later Turkic and Mongolian empires a number of important culture words including Turkish tängri, Mongolian tenggeri, was originally the Xiongnu word for “heaven”, chengli (tháːŋ-wrə́j). 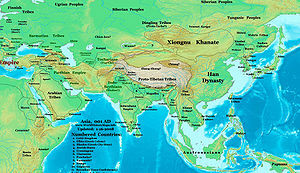 Titles such as tarqan, tegin and kaghan were also inherited from the Xiongnu language and probably of Yeniseian origin. According to Vovin (2007) the Xiongnu likely spoke a Yeniseian language. They were possibly a southern Yeniseian branch. Chinese sources link the Tiele people and Ashina to the Xiongnu, not all Turkic peoples. According to the Book of Zhou and the History of the Northern Dynasties, the Ashina clan was a component of the Xiongnu confederation, but this connection is disputed, and according to the Book of Sui and the Tongdian, they were "mixed nomads" (traditional Chinese: 雜胡; simplified Chinese: 杂胡; pinyin: zá hú) from Pingliang. The Ashina and Tiele may have been separate ethnic groups who mixed with the Xiongnu. Indeed, Chinese sources link many nomadic peoples (hu; see Wu Hu) on their northern borders to the Xiongnu, just as Greco-Roman historiographers called Avars and Huns "Scythians". The Greek cognate of Tourkia (Greek: Τουρκία) was used by the Byzantine emperor and scholar Constantine VII Porphyrogenitus in his book De Administrando Imperio, though in his use, "Turks" always referred to Magyars. Such archaizing was a common literary topos, and implied similar geographic origins and nomadic lifestyle but not direct filiation. Some Uyghurs claimed descent from the Xiongnu (according to Chinese history Weishu, the founder of the Uyghur Khaganate was descended from a Xiongnu ruler), but many contemporary scholars do not consider the modern Uyghurs to be of direct linear descent from the old Uyghur Khaganate because modern Uyghur language and Old Uyghur languages are different. Rather, they consider them to be descendants of a number of people, one of them the ancient Uyghurs. The political center of the Xiongnu state was in Mongolia and almost all of the Xiongnu kings were buried in Mongolia. In the 1920s, Pyotr Kozlov's excavations of the royal tombs at the Noin-Ula burial site in northern Mongolia that date to around the first century CE provided a glimpse into the lost world of the Xiongnu. Other archaeological sites have been unearthed in Inner Mongolia and elsewhere; they represent the Neolithic and historical periods of the Xiongnu's history. Those included the Ordos culture, many of them had been identified as the Xiongnu cultures. The region was occupied predominantly by peoples showing Caucasoid features, known from their skeletal remains and artifacts. Portraits found in the Noin-Ula excavations demonstrate other cultural evidences and influences, showing that Chinese and Xiongnu art have influenced each other mutually. Some of these embroidered portraits in the Noin-Ula kurgans also depict the Xiongnu with long braided hair with wide ribbons, which is seen to be identical with the Ashina clan hair-style. Well-preserved bodies in Xiongnu and pre-Xiongnu tombs in the Mongolian Republic and southern Siberia show both Mongoloid and Caucasian features. Analysis of skeletal remains from sites attributed to the Xiongnu provides an identification of dolichocephalic Mongoloid, ethnically distinct from neighboring populations in present-day Mongolia. Russian and Chinese anthropological and craniofacial studies show that the Xiongnu were physically very heterogenous, with six different population clusters showing different degrees of Mongoloid and Caucasoid physical traits. These clusters point to significant cross-regional migrations (both east to west and west to east) that likely started in the Neolithic period and continued to the medieval Mongolian period. Sequencing of human remains from an elite Xiongnu cemetery in Duurling Nars (Northeast Mongolia) revealed a West Eurasian male with the Y-DNA haplogroup Haplogroup R1a, and mtDNA haplogroup Haplogroup U2e1. Also found were a female with mtDNA haplogroup D4, and a male with Y-DNA haplogroup C3 and mtDNA haplogroup D4, which are common haplogroups in Northeast Asia. There was no close kinship among the three specimens. Authors have speculated that these remains may reflect the racial diversity of the Xiongnu empire. A majority (89%) of Xiongnu mitochondrial sequences from the Egyin Gol Valley can be classified as belonging to Asian mitochondrial haplogroups, and nearly 11% belong to European mitochondrial haplogroups. In various kinds of ancient inscriptions on monuments of Munmu of Silla, it is recorded that King Munmu possibly came from a unknown Xiongnu-tibe or that he has partially Xiongnu ancestry. According to several historians, it is possible that this unknown tribe was originally of Koreanic origin and joined the Xiongnu confederation. Later the tribes ruling family returned to Korea and married into the royal family of Silla. There are also some Korean researchers that point out that the grave goods of Silla and of the eastern Xiongnu are alike. ^ This view was put forward to Wang Mang in AD 14. ^ Zheng Zhang (Chinese: 鄭張), Shang-fang (Chinese: 尚芳). 匈 – 字 – 上古音系 – 韻典網. ytenx.org [韻典網]. Rearranged by BYVoid. ^ Zheng Zhang (Chinese: 鄭張), Shang-fang (Chinese: 尚芳). 奴 – 字 – 上古音系 – 韻典網. ytenx.org [韻典網]. Rearranged by BYVoid. ^ "Xiongnu People". britannica.com. Encyclopædia Britannica. Retrieved 25 July 2015. ^ a b Grousset, Rene (1970). The Empire of the Steppes. Rutgers University Press. pp. 19, 26–27. ISBN 978-0-8135-1304-1. ^ a b Harmatta 1994, p. 488: "Their royal tribes and kings (shan-yii) bore Iranian names and all the Hsiung-nu words noted by the Chinese can be explained from an Iranian language of Saka type. It is therefore clear that the majority of Hsiung-nu tribes spoke an Eastern Iranian language." ^ 高晶一, Jingyi Gao (2017). 確定夏國及凱特人的語言為屬於漢語族和葉尼塞語系共同詞源 [Xia and Ket Identified by Sinitic and Yeniseian Shared Etymologies]. Central Asiatic Journal. 60 (1–2): 51–58. doi:10.13173/centasiaj.60.1-2.0051. JSTOR 10.13173/centasiaj.60.1-2.0051. ^ Di Cosmo 2002, 2. ^ Di Cosmo 2002, 129. ^ a b Di Cosmo 2002, 107. ^ Di Cosmo 1999, 892–893. ^ Pulleyblank 2000, p. 20. ^ a b Di Cosmo 1999, 892–893 & 964. ^ Toh 2005, p. 11. ^ 又《漢書》：“使王烏等窺匈奴。法，漢使不去節，不以墨黥面，不得入穹盧。王烏等去節、黥面，得入穹盧，單於愛之。” from Miscellaneous Morsels from Youyang, Scroll 8 Translation from Reed, Carrie E. (2000). "Tattoo in Early China". Journal of the American Oriental Society. 120 (3): 360–376. doi:10.2307/606008. JSTOR 606008. ^ a b Yü, Ying-shih (1986). "Han Foreign Relations". The Cambridge History of China, Volume 1: The Ch'in and Han Empires, 221 BC – AD 220. Cambridge: Cambridge University Press. p. 384. ISBN 978-0-521-24327-8. ^ a b c Barfield, Thomas J. (1981). "The Hsiung-nu imperial confederacy: Organization and foreign policy". The Journal of Asian Studies. 41 (1): 45–61. doi:10.2307/2055601. JSTOR 2055601. ^ Qian Sima; Burton Watson (January 1993). Records of the Grand Historian: Han dynasty. Renditions-Columbia University Press. pp. 161–. ISBN 978-0-231-08166-5. ^ Monumenta Serica. H. Vetch. 2004. p. 81. ^ Veronika Veit, ed. (2007). The role of women in the Altaic world: Permanent International Altaistic Conference, 44th meeting, Walberberg, 26–31 August 2001. Volume 152 of Asiatische Forschungen (illustrated ed.). Otto Harrassowitz Verlag. p. 61. ISBN 978-3-447-05537-6. Retrieved 8 February 2012. ^ Michael Robert Drompp (2005). Tang China and the collapse of the Uighur Empire: a documentary history. Volume 13 of Brill's Inner Asian library (illustrated ed.). BRILL. p. 126. ISBN 978-9004141292. Retrieved 8 February 2012. ^ Lin Jianming (林剑鸣) (1992). 秦漢史 [History of Qin and Han]. Wunan Publishing. pp. 557–8. ISBN 978-957-11-0574-1. 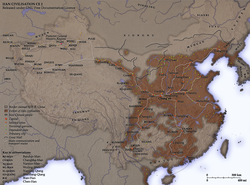 ^ China: Dawn of a Golden Age, 200–750 AD. Metropolitan Museum of Art. 2004. pp. 18–. ISBN 978-1-58839-126-1. ^ James A. Millward (2007). Eurasian crossroads: a history of Xinjiang. Columbia University Press. p. 20. ISBN 978-0-231-13924-3. Retrieved 2011-04-17. ^ Julia Lovell (2007). The Great Wall: China Against the World, 1000 BC – AD 2000. Grove Press. p. 73. ISBN 978-0-8021-4297-9. Retrieved 2011-04-17. ^ Alfred J. Andrea; James H. Overfield (1998). The Human Record: To 1700. Houghton Mifflin. p. 165. ISBN 978-0-395-87087-7. Retrieved 2011-04-17. ^ Yiping Zhang (2005). Story of the Silk Road. China Intercontinental Press. p. 22. ISBN 978-7-5085-0832-0. Retrieved 2011-04-17. ^ Charles Higham (2004). Encyclopedia of ancient Asian civilizations. Infobase Publishing. p. 409. ISBN 978-0-8160-4640-9. Retrieved 2011-04-17. ^ Indian Society for Prehistoric & Quaternary Studies (1998). Man and environment, Volume 23, Issue 1. Indian Society for Prehistoric and Quaternary Studies. p. 6. Retrieved 2011-04-17. ^ Adrienne Mayor (22 September 2014). The Amazons: Lives and Legends of Warrior Women across the Ancient World. Princeton University Press. pp. 422–. ISBN 978-1-4008-6513-0. ^ Grousset, Rene (1970). The Empire of the Steppes. Rutgers University Press. p. 34. ISBN 978-0-8135-1304-1. ^ Han Shu (Beijing: Zhonghua shuju ed) 94B, p. 3824. ^ Grousset, Rene (1970). The Empire of the Steppes. Rutgers University Press. pp. 42–47. ISBN 978-0-8135-1304-1. ^ Grousset, Rene (1970). The Empire of the Steppes. Rutgers University Press. pp. 37–38. ISBN 978-0-8135-1304-1. ^ Grousset, Rene (1970). The Empire of the Steppes. Rutgers University Press. p. 39. ISBN 978-0-8135-1304-1. ^ Grousset, Rene (1970). The Empire of the Steppes. Rutgers University Press. p. 53. ISBN 978-0-8135-1304-1. ^ Grousset, Rene (1970). The Empire of the Steppes. Rutgers University Press. p. 54. ISBN 978-0-8135-1304-1. ^ Grousset, Rene (1970). The Empire of the Steppes. Rutgers University Press. pp. 56–57. ISBN 978-0-8135-1304-1. ^ Grousset, Rene (1970). The Empire of the Steppes. Rutgers University Press. pp. 57–58. ISBN 978-0-8135-1304-1. ^ Vaissière, Étienne. "Xiongnu". Encyclopedia Iranica. DNA testing of the remains of purported Huns has so far proved inconclusive in determining their origin. ^ Beckwith 2009, p. 405: "Accordingly, the transcription now read as Hsiung- nu may have been pronounced * Soγdâ, * Soγlâ, * Sak(a)dâ, or even * Skla(C)da, etc." ^ Denis, Sinor. Aspects of Altaic Civilization III. ^ Howorth, Henry H. (Henry Hoyle). History of the Mongols from the 9th to the 19th century. London : Longmans, Green – via Internet Archive. ^ "Sun and Moon" (JPG). depts.washington.edu. ^ Craig Benjamin (2007, 49), In: Hyun Jin Kim, The Huns, Rome and the Birth of Europe. Cambridge University Press. 2013. page 176. ^ Hyun Jin Kim, The Huns, Rome and the Birth of Europe. ISBN 978-1-107-00906-6. Cambridge University Press. 2013. page 31. ^ Du, You (1988). 辺防13 北狄4 突厥上. 《通典》 [Tongdian] (in Chinese). 197. Beijing: Zhonghua Book Company. p. 5401. ISBN 978-7-101-00258-4. ^ "Об эт нической принадлежности Хунну". rudocs.exdat.com. ^ Jenkins, Romilly James Heald (1967). De Administrando Imperio by Constantine VII Porphyrogenitus. Corpus fontium historiae Byzantinae (New, revised ed.). Washington, D.C.: Dumbarton Oaks Center for Byzantine Studies. p. 65. ISBN 978-0-88402-021-9. Retrieved 28 August 2013. According to Constantine Porphyrogenitus, writing in his De Administrando Imperio (ca. 950 AD) "Patzinakia, the Pecheneg realm, stretches west as far as the Siret River (or even the Eastern Carpathian Mountains), and is four days distant from Tourkia (i.e. Hungary)." ^ Günter Prinzing; Maciej Salamon (1999). Byzanz und Ostmitteleuropa 950–1453: Beiträge zu einer table-ronde des XIX. International Congress of Byzantine Studies, Copenhagen 1996. Otto Harrassowitz Verlag. p. 46. ISBN 978-3-447-04146-1. Retrieved 9 February 2013. ^ Peter B. Golden (1992). "Chapter VI – The Uyğur Qağante (742–840)". An Introduction to the History of the Turkic Peoples: Ethnogenesis and State-Formation in Medieval and Early Modern Eurasia and the Middle East. p. 155. ISBN 978-3-447-03274-2. ^ Nabijan Tursun. "The Formation of Modern Uyghur Historiography and Competing Perspectives toward Uyghur History". The China and Eurasia Forum Quarterly. 6 (3): 87–100. ^ James A. Millward & Peter C. Perdue (2004). "Chapter 2: Political and Cultural History of the Xinjiang Region through the Late Nineteenth Century". In S. Frederick Starr (ed.). Xinjiang: China's Muslim Borderland. M. E. Sharpe. pp. 40–41. ISBN 978-0-7656-1318-9. ^ Susan J. Henders (2006). Susan J. Henders (ed.). Democratization and Identity: Regimes and Ethnicity in East and Southeast Asia. Lexington Books. p. 135. ISBN 978-0-7391-0767-6. Retrieved 2011-09-09. ^ Reed, J. Todd; Raschke, Diana (2010). The ETIM: China's Islamic Militants and the Global Terrorist Threat. ABC-CLIO. p. 7. ISBN 978-0-313-36540-9. ^ Honeychurch, William. "Thinking Political Communities: The State and Social Stratification among Ancient Nomads of Mongolia". The Anthropological Study of Class and Consciousness: 47. ^ "Archaeologist D.Erdenebaatar Эрдэмтэн Д.Эрдэнэбаатар: Хүннүгийн хаадын булш Монголд л бий". ^ Lebedynsky 2007, p. 125 "Europoid faces in some depictions of the Ordos, which should be attributed to a Scythian affinity"
^ Lebedynsky 2007, p. 125 "The Mongoloid types of the Transbaikal area and Central and Eastern Mongolia are strongly contrasted with the Europoid type displayed at the same time by the Scythian nomads occupying Western Mongolia and their predecessors of the Bronze age." ^ A. V. Davydova, Ivolginskii arkheologicheskii kompleks II. Ivolginskii mogil’nik. Arkheologicheskie pamiatniki Siunnu 2 (Sankt-Peterburg 1996). А. В. Давыдова, Иволгинский археологи-ческий комплекс II. Иволгинский могильник. Археологические памятники Сюнну 2 (Санкт-Петербург 1996). ^ S. S. Miniaev, Dyrestuiskii mogil’nik. Arkheologicheskie pamiatniki Siunnu 3 (Sankt-Peterburg 1998). С. С. Миняев, Дырестуйский могильник. Археологические памятники Сюнну 3 (Санкт-Петербург 1998). ^ Ts. Törbat, Keramika khunnskogo mogil’nika Burkhan-Tolgoi. Erdem shinzhilgeenii bichig. Arkheologi, antropologi, ugsaatan sudlal 19,2003, 82–100. Ц. Тѳрбат, Керамика хуннского могильника Бурхан-Толгой. Эрдэм шинжилгээний бичиг. Археологи, антропологи, угсаатан судлал 19, 2003, 82–100. ^ Ts. Törbat, Tamiryn Ulaan khoshuuny bulsh ba Khünnügiin ugsaatny büreldekhüünii asuudald. Tükhiin setgüül 4, 2003, 6–17. Ц. Төрбат, Тамирын Улаан хошууны булш ба Хүннүгийн угсаатны бүрэлдэхүүний асуудалд. Түүхийн сэтгүүл 4, 2003, 6–17. ^ Ningxia Cultural Relics and Archaeology Research Institute (寧夏文物考古研究所); Chinese Academy of Social Sciences Archaeology Institute Ningxia Archaeology Group; Tongxin County Cultural Relics Administration (同心縣文物管理所) (1988). 寧夏同心倒墩子匈奴墓地. 考古學報 [Archaeology Journal] (3): 333–356. ^ Miller, Bryan (2011). Jan Bemmann (ed.). Xiongnu Archaeology. Bonn: Vor- und Fruhgeschichtliche Archaeologie Rheinische Friedrich-Wilhelms-Universitat Bonn. ISBN 978-3-936490-14-5. ^ Purcell, David. "Maps of the Xiongnu Cemetery at Tamiryn Ulaan Khoshuu, Ogii nuur, Arkhangai Aimag, Mongolia" (PDF). The Silk Road. 9: 143–145. ^ a b Purcell, David; Kimberly Spurr. "Archaeological Investigations of Xiongnu Sites in the Tamir River Valley" (PDF). The Silk Road. 4 (1): 20–31. ^ a b Lai, Guolong. "The Date of the TLV Mirrors from the Xiongnu Tombs" (PDF). The Silk Road. 4 (1): 34–43. ^ Miller, Bryan (2011). Jan Bemmann (ed.). Xiongnu Archaeology. Bonn: Vor- und Fruhgeschichtliche Archaologie Rheinische Friedrich-Wilhelms-Universitat Bonn. p. 23. ISBN 978-3-936490-14-5. ^ Miller, Bryan (2011). Jan Bemmann (ed.). Xiongnu Archaeology. Bonn: Vor- und Fruhgeschichtliche Archaologie Rheinische Friedrich-Wilhelms-Universitat Bonn. p. 24. ISBN 978-3-936490-14-5. ^ Keyser-Tracqui, Christine; Crubézy, Eric; Ludes, Bertrand (2003). "Nuclear and Mitochondrial DNA Analysis of a 2,000-Year-Old Necropolis in the Egyin Gol Valley of Mongolia". The American Journal of Human Genetics. 73 (2): 247–60. doi:10.1086/377005. PMC 1180365. PMID 12858290. ^ a b c d e f g Psarras, Sophia-Karin (2003). "Han and Xiongnu: A Reexamination of Cultural and Political Relations". Monumenta Serica. 51: 55–236. doi:10.1080/02549948.2003.11731391. JSTOR 40727370. ^ Cho Gab-je. 騎馬흉노국가 新羅 연구　趙甲濟(月刊朝鮮 편집장)의 심층취재　내 몸속을 흐르는 흉노의 피 (in Korean). Monthly Chosun. Retrieved 2016-09-25. ^ 김운회 (2005-08-30). 김운회의 '대쥬신을 찾아서' <23> 금관의 나라, 신라” (in Korean). 프레시안. Retrieved 2016-09-25. ^ 경주 사천왕사(寺) 사천왕상(四天王像) 왜 4개가 아니라 3개일까 (in Korean). 조선일보. 2009-02-27. Archived from the original on 2014-12-30. Retrieved 2016-09-25. ^ "자료검색>상세_기사 | 국립중앙도서관". www.nl.go.kr. Retrieved 2019-04-15. Beckwith, Christopher I. (16 March 2009). Empires of the Silk Road: A History of Central Eurasia from the Bronze Age to the Present. Princeton University Press. ISBN 978-0-691-13589-2. Retrieved 30 May 2015. Csányi, B. et al. 2008. Y-Chromosome Analysis of Ancient Hungarian and Two Modern Hungarian-Speaking Populations from the Carpathian Basin[dead link]. Annals of Human Genetics, 2008 March 27, 72(4): 519–534. Harmatta, János (1 January 1994). "Conclusion". In Harmatta, János (ed.). History of Civilizations of Central Asia: The Development of Sedentary and Nomadic Civilizations, 700 B. C. to A. D. 250. UNESCO. pp. 485–492. ISBN 978-9231028465. Retrieved 29 May 2015. Maenschen-Helfen, Otto (1973). The World of the Huns: Studies in Their History and Culture. University of California Press. ISBN 978-0-520-01596-8. Retrieved February 18, 2015. Zhang, Bibo (张碧波); Dong, Guoyao (董国尧) (2001). 中国古代北方民族文化史 [Cultural History of Ancient Northern Ethnic Groups in China]. Harbin: Heilongjiang People's Press. ISBN 978-7-207-03325-3. Li, Chunxiang; Li, Hongjie; Cui, Yinqiu; Xie, Chengzhi; Cai, Dawei; Li, Wenying; Victor, Mair H.; Xu, Zhi; Zhang, Quanchao; Abuduresule, Idelisi; Jin, Li; Zhu, Hong; Zhou, Hui (2010). "Evidence that a West-East admixed population lived in the Tarim Basin as early as the early Bronze Age". BMC Biology. 8: 15. doi:10.1186/1741-7007-8-15. PMC 2838831. PMID 20163704.